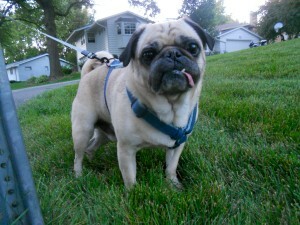 Piggy is an 8 year old fawn pug from an owner surrender. Piggy is neutered and up to date on shots. Piggy is doing really great! He is so wonderful and such a little cuddlebear! We have been doing lots of fun things-we take trips to the pet stores, walk around Aksarben and the neighborhood, and hang out at home and with the neighbor dogs! Our dogs love to sleep on Kuranda Dog beds, but we don’t have enough for everyone. If you would like to donate a bed at a special wholesale price for a another dog to sleep in comfort, please donate a Kuranda dog bed.